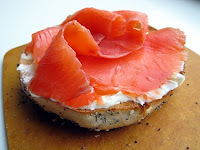 The news recently carried the story that some rabbis are questioning the kosher status of lox (link). As it turns out, this is technically incorrect (link). Here is the real story, and its larger theological implications. It has long been known that parasitic worms infest fish. The rule, as formulated in the Talmud (Chullin 67b), is that parasites that grow inside an animal are permissible to eat. If they grow outside an animal and then enter, or they exit an animal and then re-enter, they are forbidden. The Gemara specifically says that darnei (maggots?) found under the skin of fish is permissible. Based on this, the Shulchan Arukh (Yoreh De'ah 84:16) explicitly distinguishes between parasites found in fish. If they are found in a fish's internal organs then they are forbidden because they likely came from outside and were eaten by the fish. But if they are found in a fish's flesh or under a fish's skin, they are permitted because they probably grew there. This means that if there is a general infestation of problematic parasites, you must check every fish before eating it. If the parasites are permissible, there is no need to check for them and the fish may be eaten. It has now come to the attention of various rabbis that parasitic worms (Anisakis) that are regularly found in fish's flesh are swallowed by fish and do not grow exclusively inside them. If that's the case, all of these worms, regardless of where they are found in a fish, should be forbidden because they came from outside the fish. Currently, infestation is only a problem in fish caught in the wild but not in farmed fish. Since lox is made from farmed fish, no one is suggesting that it might be forbidden. Many other fish, however, are now under question. Here's the problem. The Gemara and codes all state that parasites found in the flesh of fish grew there and are permitted. Is the Gemara wrong about this? There are a number of ways to answer this question, which parallel the ways I have outlined elsewhere to deal with halakhic responses to scientific developments (link). We can draw a parallel between possible responses to this issue with that of the talmudic ruling that one may kill lice on Shabbos because they do not reproduce (Shabbos 107b). One response is to say that the Gemara is wrong but the law is fixed and cannot change. Therefore, one may kill lice on Shabbos and eat the fish, even if we now know that the reasons for these rulings are scientifically incorrect. The law has been established and we currently have no mechanism for changing that law. Alternately, one may say that the law must change because it is based on false premises. These are, understandably, difficult positions to take but some have regarding lice (e.g. R. Yosef Kafach in his commentary to Mishneh Torah, Hilkhos Shabbos ch. 11 n. 4 rules that the law must change because it is based on a false premise and R. Menachem Kasher in Torah Shelemah, vol. 1 no. 710 rules that despite the false premise, the law cannot be changed). Another response is to say that the Gemara is correct and the fact that we see things to the contrary only means that things have changed since then. The parasites in fish used to grow in their flesh but at some point in time those parasites stopped growing in fish and other parasites entered the equation. Similarly, lice used to reproduce asexually but now have changed. This is farfetched because there is no evidence for such a change and it seems quite implausible. It is, however, nearly impossible to disprove conclusively. A further response is to reinterpret the original passages in the Gemara. One could say that the somewhat cryptic and euphemistic talmudic terminology never meant that the parasites grow in the fish's flesh. Rather, it referred to something else which corresponds to what we currently see. Nothing has changed physically and the Gemara's ruling remains in force. In the case of the fish, the parasite's latching onto the fish's flesh gives it the status of the fish and is therefore permitted. Regarding lice, the Gemara meant that lice eggs are invisible to the unaided eye and therefore attain the status of the item on which they grow (e.g. fruit). Even if you cannot offer a satisfactory interpretation of the Gemara, the bottom line is what we know: the Gemara ruled leniently and nothing seems to have changed since then. Therefore, we must also rule leniently. From what I understand from a recent article by R. Chaim Goldberg of the OU in Hamodia (link - PDF), R. Yisroel Belsky of the OU takes position #3 above: nothing has changed and therefore the fish are still permissible. And see the video in the following link, where R. Moshe Elefant of the OU expresses a lenient position: link. What I find most remarkable is the willingness of those who are strict to change the undisputed ruling of the Gemara and codes based on new science. This is what I have called in the past "Progressive Halakhah" (I, II). Should we be changing established halakhah based on scientific advances? The halakhists evidently think that we should.